With just a couple of weeks remaining until San Diego Comic Con 2014, Bandai America releases their list of exclusive merchandise. Following last year’s 24 karat gold Legacy Power Morpher and Deluxe Gosei Morpher, 2014 Comic Con attendees will have their chance to purchase a 24 karat gold Legacy Dragon Dagger, priced at $150. The full-size Dragon Dagger includes die-cast parts and highly detailed, intricate design. Play sounds from the original Mighty Morphin series by pressing different combinations on the flute keys themselves, or summon Tommy’s Green Dragonzord by pressing on the mouthpiece. Vinyl toy collectors will also be able to purchase a limited edition Tokyo Vinyl Mighty Morphin Power Rangers Green Ranger. These hyper-stylized, chunky figures were designed by acclaimed Japanese artist and toy designer, Touma. Only 1,000 figures are available for purchase and priced at $25. The third and last Power Ranger toy Comic Con exclusive is a Mighty Morphin Power Rangers Ranger Key Set, priced at $30 and only 700 produced. The Ranger Keys included in the complete set unlock sounds and features throughout the Power Rangers Super Megaforce toy line, and can be scanned for digital play with the Power Rangers Scanner App available for Apple and Android. 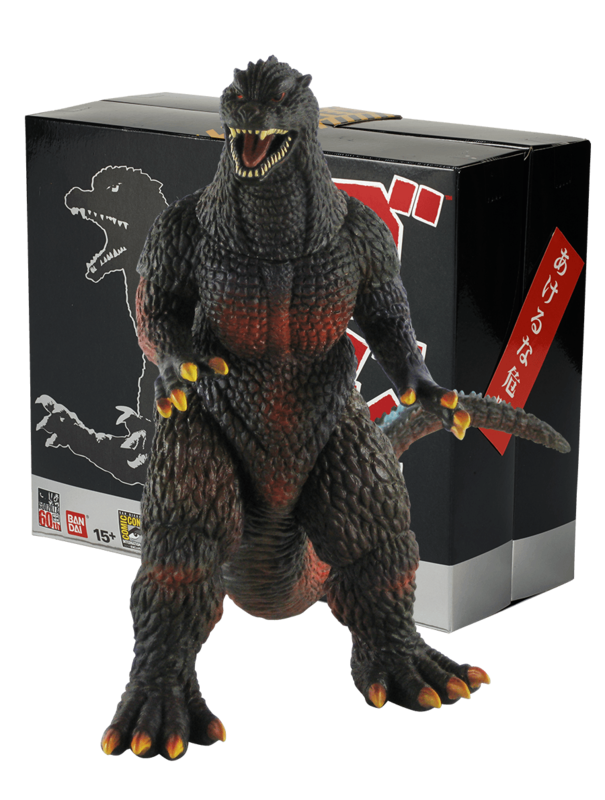 Lastly, for kaiju fans, Bandai also announced a 60th Anniversary Godzilla figure, that stands at 6.5 inches, and comes with exclusive diorama packaging. Only 500 pieces will be sold and they’re priced at $60. As you open the package a city amid destruction rises up to become the back-drop for your attacking Godzilla figure. With the colors of the burning city reflected across his massive body and his spine aglow with the tell-tale radioactive energy for his Atomic Breath, you can imagine the imminent destruction of his foes and hear the final echo of his iconic roar as he slips back into the darkest depths of the sea until he’s awakened once again. These items are exclusive to the Bandai Booth in the Exhibit Hall at San Diego Comic Con 2014. While specific booth activities have yet to be announced, Bandai’s Comic Con exclusive page noted that visitors to the Bandai booth could win a chance to voice a character in a Power Rangers episode as well as prizes for the best Power Rangers cosplay. San Diego Comic Con is July 24 to July 27 2014 in San Diego, California.